I am very proud of my mother for going back to school a few years ago and getting her teaching degree. I wanted to give her something useful that worked as a mention to her being a teacher. So I thought apples for the teacher. This is a pretty basic crochet pattern that even a beginner to the world of crochet can try out. I hope you like them too. 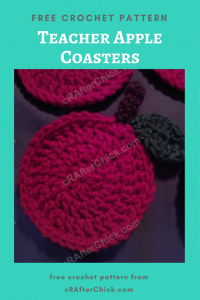 Cut yarn, pull through and finish off red apple part of coaster. 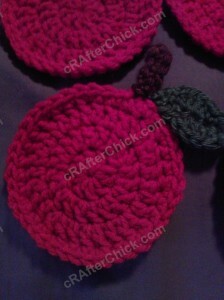 With Brown Yarn, attach to apple with a sl st where you want the stem to go. Chain 7. Place a sc in the third ch from hook and each of the following 4 ch. Sl st back into the apple coaster where you started chain. 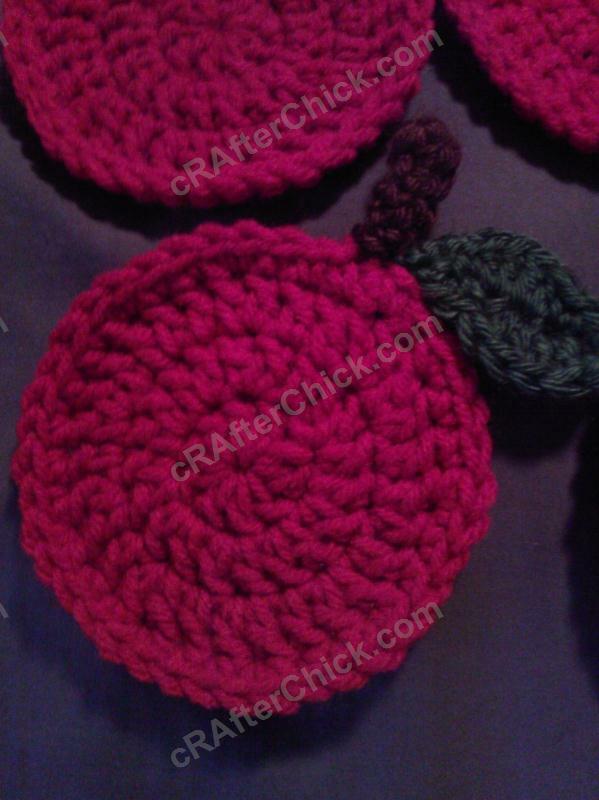 Cut your yarn, pull through and finish off the apple stem. 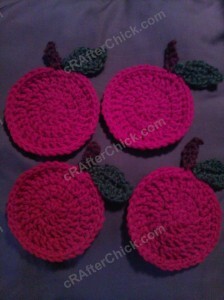 With Green yarn for the apple’s stem, chain 7. Sc in third ch from hook, hdc in next, dc in next, hdc in following and sc in last ch. Sl st into same stitch turning your forming leaf clockwise so you are now working on the unworked side of chain. Ch 1, hdc in next st, dc in next, hdc in following, sc into last st and connect to first st with a sl st. Leave a long enough tail when cutting yarn to be able secure it into place on the stem. Use the tail and large blunt eye yarn / tapestry needle to sew the leaf into place. I found it works best to secure into top as apple as well as stem. Pull yarn through to back off project before finishing off. There you go. 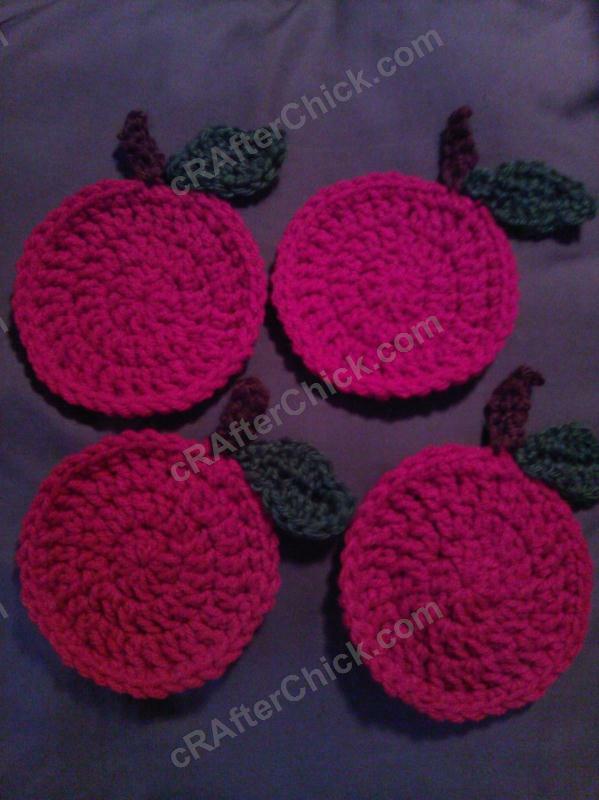 You can whip up a whole set for the special teacher or teachers in your life. They make cute and thoughtful gifts without breaking the bank or tons of time.